How apt for halloween! A real life TROLL. I think my favourite insult here is that I have a ‘naturally worried expression’. It makes me sound like a sympathetic minor character in a novel. So what to do about it? My boyfriend was of the very firm view that we should hunt this man down, and give him a wedgie. I think there was also some reference to ‘bogwashing the little ****’. Anyway, I couldn’t be bothered with that. I considered ignoring the comments completely and just leaving them there. But I like to keep my Instagram feed as a place for my friends to see what I’m up to, rather than a forum for a sad man to ventilate his issues with women. So I decided to delete all the comments. To delete them, I had to go through each and every one. 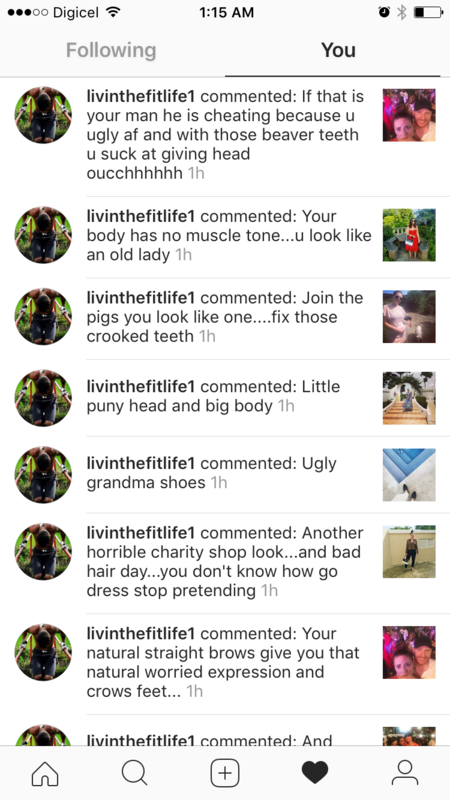 Here, a stranger had pored over every single one of my photos to think of hurtful things to say. It probably took quite a while given the number and variety of abusive comments. What an oddly compulsive way to spend time. But maybe there’s a little bit of that obsessiveness in all of us: for example, my new year’s resolution next year is to learn Will Smith’s Miami song off by heart. I suppose some might say THAT’s a pointless use of time. A few questions spring to mind. Who is this person? Why do they spend time doing this? Well, whoever he is, I doubt he resembles Mr Stock-photo-of-buff-man who appears as his profile picture. As to why: if I had to guess, I’d venture that this person is addicted to the thrill of posting this abuse. A little reckless moment that makes him feel potent for a second. Like the thrill one gets when one presses ‘go to checkout’ on something a bit spendy, orders a second glass of wine at a weekday lunch or goes all in in poker. Purer, better, examples of the feeling would be taking your hands off the handlebars for a few seconds, diving off a boat into the sea or deciding to make a large charitable donation. Perhaps Trolly-pants should do more of those things. He might feel a bit better about himself.